Migrant Gastro Club is having its first pop-up on Saturday 27th February at Osteria Del Mercado in Leadenhall Market, EC3, from 6pm. 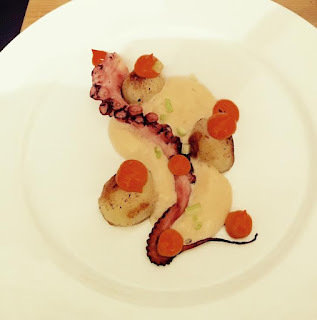 The first pop-up is a Spanish one, with 6 courses including Gazpacho, Pulpo and 'Rabo de Toro'. Tickets are just £36 - please support their first venture! "The first chapter of our story as Migrant Gastro Club will be: SPANISH SESSION. Let us delight you with a menu based on Spanish culture, bringing you exceptional dishes with balance and personality. This first event will take place at "Osteria del Mercato", on Saturday 27th of February. We will be open from 18:00. You will be served an exquisite six-course meal, taking you through various regions of Spain, priced at £36 per person (excluding drinks). Due to high demand and limited sitting space, there is a pre-paid ticketing scheme for you to reserve your table for the event. The amount of tickets you buy represents the size of your party. At the venue, you will be presented with a specially designed Spanish wine list to complement the menu. Don't miss this special occasion! For more information about reservations or any further questions please contact us at 07783384576 or email us at migrantgastroclub@gmail.com"